Diamonds are women’s best friend, so goes the saying, but history shows that diamonds are men’s best friend as well. Some of the most expensive and best known diamonds have been the prized possessions of the rich or famous rulers. Koh-i-Noor is possibly the most famous diamond in history and possibly the most expensive diamond in the world. It is considered to be a priceless possession of the British Crown Jewels presently, it is also one of the largest and most flawless diamond. The name Koh-i-Noor means ‘Mountain of Light’, and originally is believed to be uncut 793 carats in size. Presently the diamond is 105.6 metric carat in volume and weighs about 21.6 grams in the current cut form and state. The diamond is 5000 years old according to legends and mythology. It is supposed to be referred to as the Syamantaka Jewel in the ancient Sanskrit Scriptures of Hindu or Indian Mythology. According to popular folklore, it passed many hands before being used as a third eye of a Goddess installed by an ancient ruler family of an Indian territory known as the Kakatiyas. The first recognisable and confirmed written record of Koh-i-Noor diamond is found in Babur-Namah, a memoir of an Indian Emperor Babur. According to the documents, the diamond belonged to unnamed Afghan king, and changed a number of hands before being captured by him. The diamond is believed to have brought bad luck to many, and the cause of a number of bitter battles. It is believed that Shah Jahan ordered mounting of the Koh-i-Noor in his famous Peacock Throne. Nadir Shah of Persia is believed to have taken away the Peacock Throne during 1739, which could not be located in later times, but the Koh-i-Noor diamond resurfaced in Punjab of India in 1813. It was bartered with an Indian ruler. The British who were ruling India during that time conquered Punjab, a princely state and came across the diamond. As per records it was uncut and 186 carats when it was captured by the British for their Crown Queen Victoria in 1851. The Koh-i-Noor diamond has been inducted as crown jewels of the British Empire since then, and is generally worn by the female members of the British Monarchy. Prince Albert supposedly took the diamond to Netherland to be cut and polished for better shine. Mr. Cantor is reported to have worked on the diamond cutting it for 38 days, giving it an oval shape, and reduce the weight to 108.93 carats. The Prince was not satisfied and further cutting reduced the diamond to its present 105.602 carats, but reflects light extremely well. It is kept in the Windsor castle, but at times it is kept in the Tower of London. The Koh-i-Noor is believed to bring bad luck to males who wear it, and women are immune to its ill affect. 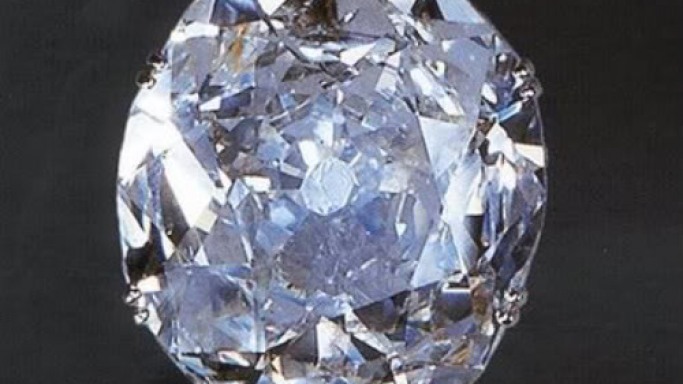 Another 182 carat diamond nestled in Iran is considered to be Koh-i-Noor’s double or twin. Though the diamond is valued at 20 billion US Dollars even conservatively, the history and folklore associated with the diamond makes it priceless.